It's summertime, and the livin' is far from easy in Candy's Land this week. Mom has been up to her eyeballs in meetings and obligations . . . more so that usual (and already her commitments are more than the average calendar, she sighs and realizes). But every once and a while, in the whirl of a work week, something can stop you in your tracks and make you smell a distant memory. 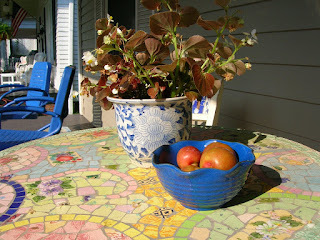 For Mom is was leaving her home one hurried morning and discovering this perfect bowl of plums on her front porch. They were a gift from her next door neighbors . . . and their fruitful backyard plum tree. Mom is just plum-crazy about plums. For her, it's not just the sweet juice and skin's sour taste; plums are the taste of summertime -- of her own backyard plum tree in her childhood home, where she spent her Halcyon days in its branches just because she could. She also recalls the plum bushes around the cow fields on Rivoli Drive, where, whether she was with her mom or her dad (or both), car breaks would slam at the site of green "hog" plums, a summertime family favorite to pick, wash and eat raw with a dip of salt to tone down the tartness. It just goes to show you that the simplest of fruits are among the grandest gestures . . . as captured so well in a love note/poem "This is Just to Say," by William Carlos Williams.